The C# and lua clients are in my personal repo. Running the C# client is straightforward. After you clone the repo you need to restore packages update the URL to the SignalR server and run the client with dotnet run. Each time you press Enter the client will generate a random weather report and send it to the server. If you type “!q:” the client will exit. The lua client is meant to run on an ESP8266 compatible board with NodeMCU firmware installed. Preparing the board to run the client requires a bit of work. The first step is to set up serial communication to the board. If the module you have is equipped with a USB port (I have the Lolin v3 board which does have a USB port) it should be enough to install a VCP (Virtual COM Port) drivers (you can find the drivers here http://www.ftdichip.com/FTDrivers.htm or here http://www.silabs.com/products/mcu/pages/usbtouartbridgevcpdrivers.aspx). If your board doesn’t have a USB port, you will need to use an additional module (e.g. Arduino) for USB-to-serial translation (you can find tutorials about setting it up on the web). The next step is to make sure that your board has the right firmware. It needs to be a NodeMCU firmware with net, http, wifi, and websocket support. You can request a build here and follow steps in this tutorial to re-image your board. When the board is ready you should be able to connect to it using a serial terminal (I used screen on Mac and Putty on Windows). On Windows determine the COM port number the board is using using the Device Manager. On Mac it will be one of the /dev/tty* devices. The speed needs to be set to 115200. When using Putty make sure the Flow Control setting is set to None or the communication will not be working correctly. We are now ready to run the client. If you haven’t already, clone the repo containing the client go to src/lua-client folder and update the URL to the SocialWeather SignalR server. Now you can transfer the file to the device (if you are connected to the device with the terminal you need to disconnect). The nodemcu-uploader Python script does the job. The command may look a bit cryptic but is quite simple. The ws is a handle to the websocket instance created by the social-weather.lua script. send is a method of the websocket class so we literally invoke the send method of websocket interactively. The argument is a SocialWeather report in the pipe format: a pipe separated list of values – temperature, weather, time, zipe code – terminated with \n. Let’s take a look at how things work under the hood. On the server side the central part is the SocialEndPoint class which handles the clients and processes their requests. If you look at the loop that processes requests it does not do any parsing on its own. Instead it offloads parsing to a formatter and deals with strongly typed instances. Formatter is a class that knows how to turn a message into an object of a given type and vice versa. In case of the SocialWeather application the only kind of messages sent to and from the server are weather reports so this is the only type formatters need to understand. When sending messages to clients the process is reversed. The server gives the formatter a strongly typed object and leaves it to formatter to turn it into a valid wire format. How does the server know which formatter to use for a given connection? All available formatters need to be registered in the DI container as well as mapped to a type they can handle and format. When establishing the connection, the client sends the format type it understands as a query string parameter. The server stores this value in the connection metadata and uses later to resolve the correct formatter for the connection. On the client side things are even simpler. The lua client has just 30 lines of code half of which is concerned with printing weather reports in a human readable form. Because the format of the connection cannot change once the connection is established message parsing can be hardcoded. The rest is just setting up the websocket to connect to the server and react to incoming message notifications. The C# client is equally simple. It contains two asynchronous loops – one for receiving messages (weather reports) from the server and one for sending messages to the server. Again, handling the wire format (which in this case is Protobuf) is hardcoded in the client. This is pretty much all I have on ASP.Net Core Sockets. With a simple application we were able to validate that the new version of SignalR can handle many scenarios the old one couldn’t. 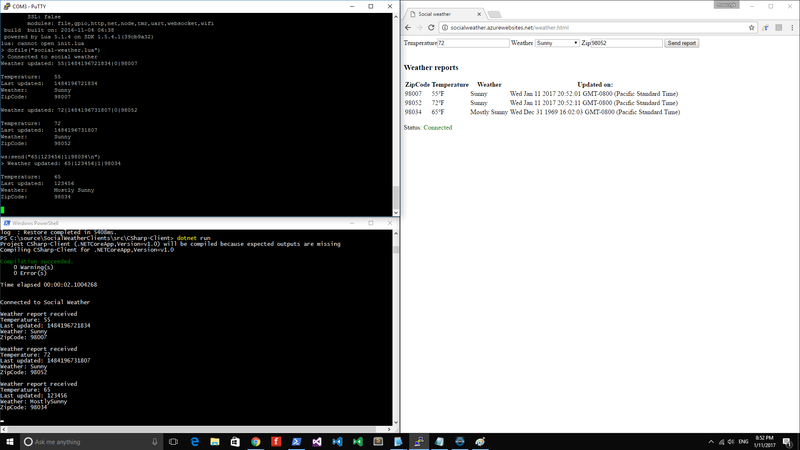 We were able to connect to the server from different platforms/environments without using a dedicated SignalR client. The server was capable of handling clients that use different and custom message formats – including a binary format (Protobuf). Finally, all this could be achieved with a small amount of relatively simple code.